The canisters shown here are some of the first products I made using reclaimed materials. 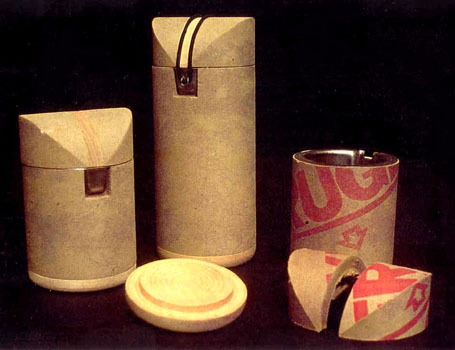 They are made from heavy cardboard tubes that form the core of the rolls of newsprint used by newspaper printing presses. The body consists of a length of tube that's been lightly sanded to remove the printing. The bottom is turned from a piece of basswood. The top consists of pieces of tube that have been sliced lengthwise, miter cut and glued back together with a wood spacer in between. A loop of 1/8" bungee holds the top in place.